Part of the fun of terrariums is establishing a little ecosystem of your own design, but sometimes plants make their own monstrous way! One issue you may encounter in your healthy terrarium is plants outgrowing your terrarium container. Vigorous plants may require pruning of leaves or stems, and enthusiastic spreading plants may require removal of pup plants. Also be sure to remove dead leaves, fronds or plants, as they may contribute to rot in your terrarium. 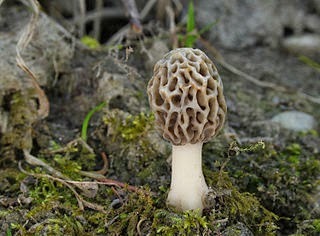 "In the very first terrarium we ever made we included a tiny morel mushroom. The next day, it had grown alarmingly out of scale in our miniature landscape, and on the morning of its third day in captivity we awoke to find the morel pushing up the lid of its apothecary jar, a fungal Frankenstein." Haha, it does look like a zombie brain popped out from the ground!